HOSTING visiting heads-of-state and international dignataries is no stress for the men and women who work in Saudi Aramco s Oil Supply and Planning and Scheduling Department (Ospas). It’s a walk in the park compared to their daily responsibilities. A world hungry for oil is relying on Saudi Aramco for efficient supply and delivery and that’s what keeps Ospas and its people busy. “Our job is to make sure Saudi Aramco’s oil, gas and refined products are fully maximised and delivered to local and global customers with maximum net revenue to Saudi Aramco,” says Ospas manager Hussain Al Qahtani. Comprising five divisions – Oil; Gas and NGL; Supply Planning and Optimisation; Terminal Division; and Refined Products – Ospas is the nerve centre of the company’s operations. The department is tasked with tracking every drop of oil and cubic foot of gas that is extracted from the kingdom’s fields. Ospas ensures they are delivered safely via plants, refineries, pipelines and terminals to Saudi Aramco’s local and global customers. Their mission is made a little easier thanks to Ospas Operations Coordination Center (OCC). 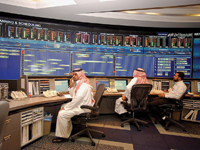 The OCC acts as a central monitoring and control hub for Saudi Aramco’s hydrocarbon and power operations kingdom-wide. Through the sophisticated supervisory control and data acquisition (Scada) system, information is gleaned from more than 44,000 real-time data points that are connected to company plants, refineries, gas-oil separation plants, terminals, pipelines and electrical power operations. The data is then projected onto the centrepiece of OCC a gigantic electronic video wall that measures 70 metres wide and three metres high. On the video wall, Ospas engineers and planners can observe the complete hydrocarbon journey from the wellhead to plant and refinery, then into pipelines and eventually to Saudi Aramco’s export terminals. Built in 2005, the video wall is unrivalled in the hydrocarbons industry. The OCC updates hydrocarbon data every 15 seconds and power distribution data every two seconds. The speed of the updates allows Ospas planners and engineers to react immediately to any emergency or anomaly they spot. Shift superintendents at Ospas have the ability and authority to control and even shut down operations with the click of a button.